The purpose of this timeline is to record the series of events of the Temple Israel reform synagogue from its planning and construction through to the time the building stopped being used as a synagogue. January 15 - First publicly announced meeting held at New Turner Hall West Fourth and Pine to build the Temple. Leadville Daily Herald, August 8, 1884. Page 4. August 11 - Foundation corner stone laid. August 12 - Survey completed. September 20 - “The new Jewish Temple of the Congregation Israel that has just been completed was dedicated last night with the most impressive ceremonies, by Rabbi Morris Sachs of Cincinnati Ohio. The corner stone of the building was laid the eleventh of last August and the building has been rushed to completion in an unparalleled short time. The building is a very handsome edifice. It is the second Hebrew Temple in this state and is an ornament to the city. The windows are of stained glass; the pews are cushioned, and the floor and platform coved with a handsome carpet. The room is lighted by sixty jets of gas. The pulpit and ark are of elegant workmanship. In the rear of the building is the gallery for the choir…. By 8 o’clock the audience room was filled to its utmost capacity. The programme of the exercises was as follows. Mr. Chairman and Gentleman of the Building Committee. As president I accept the key you have tendered me, and in the name of the congregation Israel and on behalf of its members, allow me to express to you our heartfelt thanks, for the energy, real and devotion you have displayed in the erection of this the Miracle Temple of the age. “Congregation Israel” Leadville, CO; USA. Leadville Daily Herald, September 20, 1884. p 4. Download text copy of the building dedication. No one was injured during the construction of the building. 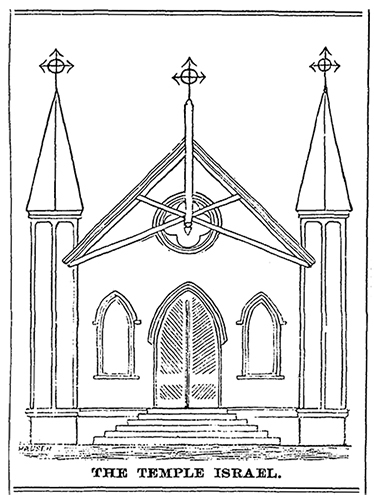 Through the sale of pew seating in the temple the congregation raised $925. One burial permit was issued for $20 to Mrs. White. Cornerstone laid on August 11. Colorado State Governor Grant donated $100 to the congregation on August 21. The congregation held five meetings and functions (payed $8 per use) at City Hall (132 and 134 East 6th Street) while the synagogue was being built. Leppel was paid $432.87 for beer, wine, and liquor. “The New Year” Leadville, CO; USA. Carbonate Chronicle, September 27, 1884. p 5. September 19- “Meeting in Temple Convention yesterday of Congregation Israel and the Election of Officers. Yesterday was an eventful one among Congregation Israel of this city, the devotees at the shrine of that unpretentious little temple on Fourth and Pine stirring at an early hour. The occasion was the annual election of officers, preceded by the reports of the returning ones. The members of the congregation were present at an unusual early hour, when exercises began. Mr. Monheimer who had occupied the distinguished chair as president for a year, submitted his message as to progress, accompanying it with remarks as follows. Trustees for the ensuing year- M.H. Monhiemer, M. Leppel, and David Heller. 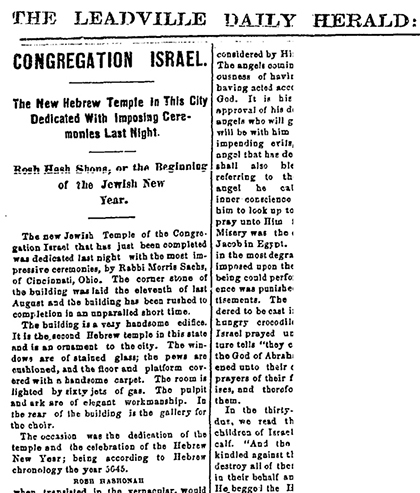 March 7- “The Congregational Israel- The Jewish Temple of the congregation Israel, located at the southwest corner of Fourth and Pine streets, was completed and dedicated on September 19 1884, with the most impressive ceremonies by Rabbi Morris Sachs, of Cinncinatti, Ohio. The building is a very handsome edifice, and the cornerstone was laid August 11, 1884. It is the second Hebrew temple in the state and is ornament to the city. The windows are of stained glass, the pews are cushioned and the floor and platform covered with a handsome Brussels carpet. The temple was dedicated on the Hebrew new year the 5645th. Mr. J.H. Monhiemer, the well-known and popular dry goods merchant, was the president of the Congregation Israel the first year after they took procession, but Mr. Issac Baer, of the firm of Baer Bros. succeeded him, being elected to the office September 19, 1885. Mr. Ben Davies is the officiating chosan. The temple has an excellent choir, composed of the following Ladies and gentlemen. The choir is an excellent one, and the Sunday school is large and continually increasing. Services are held every Friday evening, the membership now being about one hundred. The Sunday school consists of about the same number of children. A festival is held every two months for the children of the Sunday school. Gentlemen- Another year has rolled around in the history of our congregation and agreeable to the requirements of your laws, I submit to you herewith a report of my official acts. At the commencement of the year now closing, the number of members reported on our books were 63 names, of these, however, only 37 were contributors; to these have been added 14 names, 2 withdrew from member ship and none lost by death leaving us at this day a membership of 49 actual paying members. I would expect that the vice-president be authorized to expand a sum not exceeding $75 to put in good repair the road leading to the cemetery as its present condition is much to be deplored; also that four chairs be purchased for the pulpit as those we are using were borrowed for the holidays and the balance of the year ordinary ones are used. I would also inform the congregation that our organ is badly out of repair and would recommend that a new one be purchased and that your new executive board purchase one at the earliest practicable moment. With these additions to our temple it will be complete in its furnishing many years to come. I congratulate the congregation upon its financial condition, and with a reasonable effort on the part of the incoming executive board no financial troubles will be theirs, as for the first time since the completion of our house of worship we are entirely out of debt and can remain so. “Your Secretary begs leave to report that at the last annual meeting the number of members reported in good standing were 65. This I found was an error upon the part of the former secretary, as we have at present but 49 active members, and this, after adding 14 new members during the year. During the year 15 have either resigned or refused to pay their dues. “… The congregation expressed the greatest satisfaction of the financial progress of the temple, the members having been prompt and liberal in their support. “The Synagogue’s Sages” Leadville, CO; USA. Leadville Daily/Evening Chronicle, October 4, 1886. p 4. A long time had been consumed by the ladies of the society for this ball, which should have occurred on the 10th of March, but the entire success of the affair last evening, in every particular justices the statement that the preparations were not slighted, and that the committees appointed by them were the best they ever had. The City hall was considered too small, so the Tabor Opera house was secured and arranged specially for the occasion. A large dancing platform was constructed from the stage over the opera chairs far out into the auditorium, which furnished a main dancing platform of 35x65 feet, with two wings 15x30, giving ample room for the followers of terpsichorean. Professor A. Zilm, with his orchestra of 13 pieces, were provided with a raised platform, handsomely draped, in the gallery over the main entrance. The whole house was profusely decorated with flags, bunting, streamers and small banners, no part of the building or gallery appearing bare. Over the stage was a large, six pointed star- the shield of David- in the center of which were the American colors. For pews or seats at Temple Israel for the coming holidays apply to Ben Davies, 222 Harrison avenue. All are invited. ‘My Dear Friends: Young and inexperienced, I undertake, this day of my Bar Mitzvah, to tread the first step upon the most important period of my life’s path. The rosy days of my life, the golden dreams of my childhood, are now past forever, never to return, and when I turn my eyes upon the picture of my future life, which this day unrolls before my spirit, I behold the approach of days far more weighty and important than those of my past life, the coming of a time which will require all my energy. This day of my Bar Mitzvah is therefore the most important of all the days of my life, because, only from this day on am I responsible for all my religious acts and transgressions, taking upon myself all the duties and obligations of a true and faithful Israelite. Until his thirteenth birthday, the experiences of a boy are but insignificant; the house of his parents and the school room are the entire world, and he has no knowledge of all the strife this is carried on in the world without. Only with the day of Bar Mitzvah begins an entire change of his circumstances; his eyes are suddenly opened, and he looks on the large world around him. And therefore I step over the threshold of this day with great anxiety and fear, for I have no knowledge of the temptations that may await me, for no one here could tell me what the future has in store for me- fortune or misfortune, smiles or tears, happiness or misery; but this I do know- namely, that in this new world, which to-day opens itself to me, two pathways appear before me, one the path of good, the path of life and bliss; the other the path of the wicked, the path of death and curse. I hear heavenly voice of religion calling me to-day: ‘Choose thou life, light and bliss.’ Yes, I will listen to the heavenly voice; will from this day on endeavor to remain in the path of good, so that I may become a good man and a worthy member of Israel. Thus I do part from the charming days of childhood; farewell, then, happy days of my childhood with all your golden dreams; farewell, thou rosy dawn of my life, I shall never behold you again. Oh I may this house of paring from the joyful and innocent morning of my life be a blessed one, and my the pious sentiments and resolutions which now fill my heart, guard me though my future life. January 12- “Last evening the hearts of Mr. and Mrs. Richard Metz were made happy by the confirmation of their eldest son Abie P. Metz. The ceremony occurred at the Temple Israel and was witnessed by a large number of the friends of the happy parents. After the service, which as conducted by the cantor, Ben Davies, was finished, Master Metz made a very neat little speech in which he most honestly thanked his parents for the cares they had undergone for him and promising them that his duty would now be to repay them by being a dutiful son. The oration was well delivered by the young gentleman. After the exercises were finished the guests attended the reception given in honor of the confirmation at the residence of the parents on West Eighth Street. It was indeed a merry party and after the congratulations were over with, the evening was most pleasurably spent in social chat, eating and drinking. The tables fairly groaned with their load of good things to eat and drink, and many a hearty toast was given to the parents and the son. Abie received a large number of handsome and useful presents as tokens of remembrance from the many present who wished him much success in his future life. June 9- “Yesterday morning at 10:30 Mr. Theodore D. Baer presided at the sacred ceremony of the confirmation at Temple Israel. The building was crowded many young people being among the congregation. The class had been prepared for the work by Mrs. Carrie Mayer, the superintendent of the Sunday School, whose arduous labors were will repaid. The confirmants were Marie Ehrlich, Ben Ehrlich, Pearl Miller, Walter Mayer, Sam Bergman, and George Streppy. At the closing of the exercises one of Mrs. Mayer’s pupils stepped forward and in a few well chosen words of thanks to Mrs. Mayer on behalf of the class and herself presented Mrs. Mayer a set of cups and saucers beautifully hand painted. The confirmation class presented her with a costly valise. February 1- “The prettiest and most elaborate wedding ceremony that has taken place in Leadville for many years occurred last Tuesday evening, January 27, when Mr. Theodore Daniel Baer and Miss May Harriet Kahn were united in the holy bonds of matrimony. The wedding took place at Temple Emanuel and was witnessed by an immense throng of people filling all the available space, while many had to be content with a passing glimpse of the wedding party as they entered the church. The scene in the temple presented a picture which will long be remembered by those present. The entire platform about the altar was profusely decorated in the southern smilax and with palms and ferns. The colors throughout were white and pink, with the addition of natural greens. Above the altar hung a trellis of smilax, while on the altar were banked ferns and palms galore, converting it into a veritable bower. Directly back of the alter and at the point where the bride and groom were to stand, was suspended an immense wedding bell made of smilax and ferns and with a clapper of white roses. Promptly at the appointed hours, half after seven, the bridal party entered marching slowly to their places to the strains of Mendelssohn’s Wedding March. Directly behind the ushers Dr. Maurice Kahn and Mr. Julius Leon, came master Ralph Kahn, the little ring bearer, nephew to the bride, and guarded his Calla lily, containing the wedding ring, with much care. Following him came the groom on the arm of his aunt, Mrs. Adolph Baer, then the best man Mr. Jacob Kahn, and the maid of honor, Miss Tillie Kahn, brother and sister of the bride. Little Miss Evelyn Mayer followed the party, scattering rose leaves in the bride’s path, who was conducted to the altar by her father Mr. Marx Kahn. County Judge McLeod performed the marriage ceremony, which was immediately followed by the beautiful marriage service of the Jewish church, conducted by Mr. A. Schayer. September 27- “…the Sabbath of Sabbaths, and in accordance with the Mosaic law, he will transact no business of any kind on that day; the Orthodox Jew passes the day in fasting and prayer from sunset till sunset. At the Orthodox temple the Kol-Nidre sermon will be given by Rabbi A. Levitzky, the subject of speaking will be “Repentance, Prayer and Charity”. June 3- “The funeral of the late Jacob O. Hiemberger will take place this afternoon at 2:30 o’clock from Temple Israel. The body will be taken to Temple Israel, corner of West Fourth and Pine streets, this morning. From 11 o’clock this morning until 1 o’clock this afternoon those who desire may enter the temple to view the remains. June 4- From ‘Was a City of Sorrow for an Honored Citizen' “…In the temple the bier was placed before the altar. Over it, around it and filling the space on the alter platform until one could scarcely see a man standing behind them, were flowers. Pure while lilies, emblems of purity, roses of scarlet hue, symbolizing the redemption to immortality; heliotropes, carnations and every flower this is beautiful and expressive of the nobelest and loftiest sentiments of the human soul, were banked there in symbolical forms and shapes until could not see the somber black of the coffin and forcing upon one the thought that out of the blackness of death there must arise a more beautiful life which knows no death. This tribute was the expression of the Congregation Israel in sorrow for the loss of its energetic leader and in hope of his translation to the eternal congregation on high. January 16- “Quite a pretty little ceremony took place in Temple Israel at Fourth and Pine streets yesterday afternoon when Joseph Oliner, the well known young shoemaker of 110 East 6th streets was united in marriage to Miss Louise Dorn of New York city. It was witnessed by many friends of both parties. The double ceremony of a legal and church was used. To the strains of the Lohengrin wedding march played by Miss Rose Heimberger, the bride party marched up the aisle and took their places under a canopy held by Messrs. Bergerman, Miller, Hyman and Flax. Here they were met by Justice of the Peace Shaughnessy, who tied the legal nuptial knot. Then Marx Kahn performed the rites of the Hebrew church and offered the newly made Mr. and Mrs. Oliner, the glass of wine according to custom and placed the ring on the bride’s finger and the ceremony was over. November 20- “At a meeting held in Temple Emanuel, Fourth and Pine streets, last evening, local Jewish people discussed ways and means for relieving their suffering brethren in Russia, where innumerable widows and orphans had resulted as a consequence of the atrocities of the Russians. Ed. Jackson acted as chairman and Edwin Kahn as secretary. Mr. Jackson made an eloquent appeal for the suffering Jews in Russia and sprained the situation fully to his audience. Although there were only about thirty present at the meeting several hundred dollars were raised in a few minutes. January 29- “The children of all the Jews of Leadville are requested to be at Temple Israel next Sunday morning at 10:30 o’clock at the re-opening of the Hebrew Sunday school. Some of the members of the congregation have taken the matter in hand and will give the instruction of the children their personal attention. There are about thirty children who have signified their desire to join the Sunday school, and it is believed that it will be successfully carried on. October 10- “George O. Groom, Midland Employee, Attacked by Fatal Hemorrhage at End of His Run- …Groom came in on his engine from Colorado City at 2:40 yesterday afternoon. He went to his room, washed himself and cleaned up, and then went to the restaurant where he had been in the habit of taking his meals, and had dinner. He talked pleasantly with friends whose he met up in town, and toward evening, walked down to the yards to find out when he would be called for another trip. It was while on this mission that he had the conversation with a yardman regarding his excellent state of health. On his way to Harrison avenue the fatal attack came. In front of the Jewish church on West Fourth Street, at the corner of Pine, he was overcome and sank down. He did not fall suddenly, but gradually stretched out on the sidewalk. William Guyler and Larable Wood, drivers for the Crosby livery, were standing in the door of the barn across the street. As the man first stooped over he motioned for them with his arm. The men hastened to his side. He was trying to take off his coat. Blood was streaming from his mouth in a steady volume. He did not utter a word, but grew weaker and was soon unconscious. September 25- “Yom Kippur, the Jewish Day of Atonement, was ushered in last evening at Temple Israel. A fine musical program was rendered. October 10- “The trial of Willie Ferry, Willie Lowney, and George Lowney, charged with disturbing the religious services at the Temple Israel on Fourth street on the night of September 24 was concluded before Judge Harrison in the district court yesterday afternoon. It was alleged that the boys had thrown rocks against the windows of the church, which were covered with sheet tin, and had created a such a racket that several women of the congregation had fainted. The boys were seized and later arrested. November 11- “The orbital services over the remains of the late Henry Miller were held yesterday afternoon at the 2 o’clock from the residence at 130 East Seventh Street and at the Temple Israel an hour later, interment being in the Jewish cemetery. The services both at the Miller home and at the temple were largely attended. Adolph Schayer conducted the ritual and Professor T.W. Stoner delivered the funeral oration at the temple. The obsequies at the Temple Israel were very impressive and solemn, and several musical numbers were beautifully rendered by a choir composed of Misses Carey, Bonner and Hischle and Messrs. Nash and Austin accompanied by Mrs. E. T. Boyd on the organ. Miss Ethel Sandusky sang, “Oh Dry Those Tears” and Miss Beryl Bonner “Trust in the Lord” with beautiful effect, while the choir at the close of the service rendered “Gently Lord Oh, Gently Lead Us”. After the services in the temple long lines of friends and acquaintances moved slowly and silently before the coffin resting on a catafalque covered with flowers to pay their last respects to the dead and to gaze for the last time on the features now in restful repose of one whom they had known from childhood. As the long line of mournful friends was passing before the bier, Mrs. Miller the heartbroken mother of the boy whose life was so suddenly taken from him through a distressing accident on Monday evening, completely broke down and her passionate sobbing caused many a tear of deepest sorrow to come to the eyes of those who realized her suffering and anguish. November 18- “The remains of the late Adolph Schayer, who died very suddenly of heart failure on Monday afternoon, were laid to final rest in the Jewish cemetery yesterday. The services over the body of the scholar and former merchant held at Temple Israel, were largely attended by the legion of friends and former business associates of the man who in years past was a moving spirit in both charitable and business circles of Leadville. Theodore Baer conduced the ritual and in a few well chosen words extolled the life of him whose body lay in a coffin hidden by flowers, dwelling on the exalted example set by Mr. Schayer through his benevolence and charity, during the many years of his residence in the city. June 24- “All that was mortal of the late Fred Butler was laid to rest yesterday afternoon in the Jewish cemetery. As the casket was lowered into the grave, members of the congregation of the Temple Israel performed the last offices for the dead according to the ritual of the Jewish faith. At 2 o’clock in the afternoon, the services were held in the Temple Israel, the local lodge of the Elks of which the deceased was a member, having charge. Miss Ethel Sandusky with exquisite taste sang “Face to Face” and “Dry Those Tears”. The ritualistic service was solemn and impressive and was conducted by the exalted ruler K.L. Fahnestock, with becoming dignity. Newspaper notices for Jewish services until 1923 refer only to Knesseth Israel on West 5th Street.